and I still have plenty left. Yes, you read that correctly...$20. 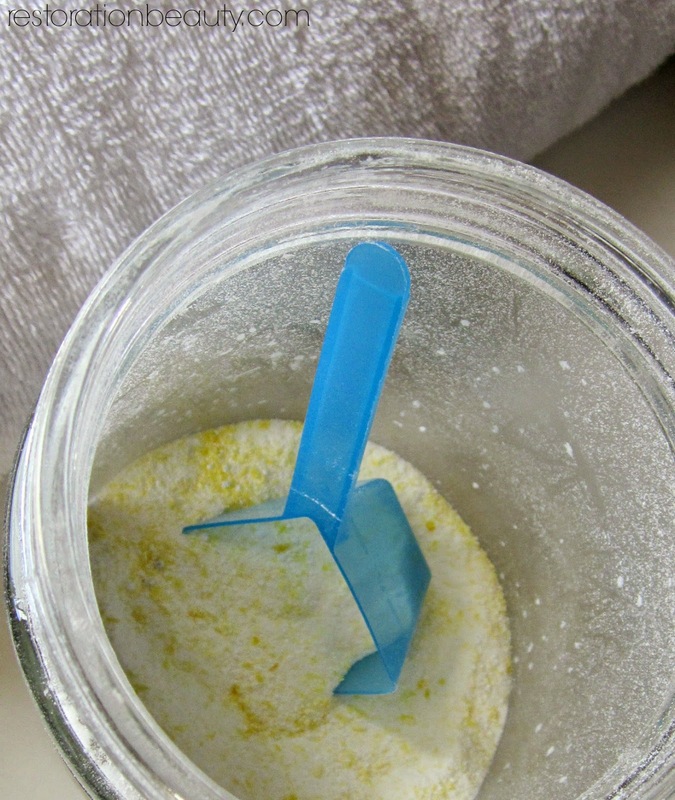 And this HOMEMADE LAUNDRY DETERGENT is wonderful. I'm talking better than ANY store bought brand I've ever tried. I'm talking I haven't even had to use stain removers since last June. I'm talking it doesn't irritate my sensitive skin. I'm talking my hubby who happens to be very picky when it comes to his laundry detergents loves this stuff! That's a big deal around here guys. BIG deal. Homemade laundry detergents have been around for eva- I know. Trust me, I would know since I've clicked on every "homemade laundry detergent" post from Pinterest I could possibly find. I was always turned off by the hassle of most recipes: boiling to melt ingredients, grating till your fingers were numb, mixing till you developed biceps and storing a year's worth detergent just right to avoid hardening. But then something amazing happened. I came across this homemade laundry detergent recipe from Black And White Obsession, last Spring (yes, almost a year ago! ), and I was like, "Finally!!! 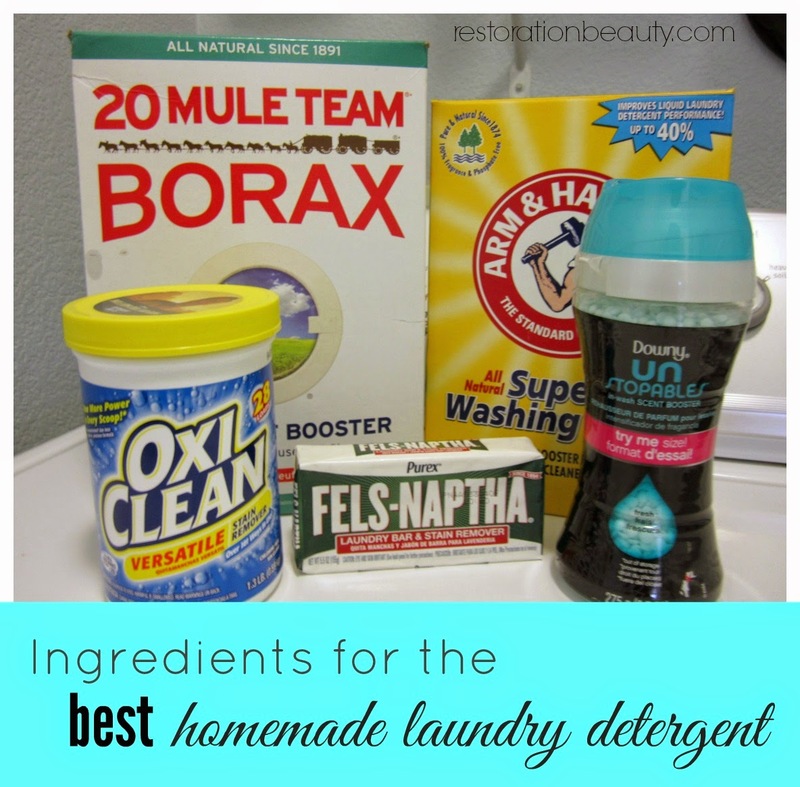 An easy homemade laundry detergent recipe I could make!" It's so fuss free and yet works so well... it's just amazing! The original recipe calls for only 3 ingredients. Three ingredients, people! And although, that's how I make it most of the time, I've included the optional 2 extra ingredients I sometimes throw in there just to spice things up. They are totally not necessary and my clothes always come out just as clean with both versions. No lie. Optional Ingredients: Fels-Naptha Soap, Downy Unstoppables (for scent). You will also need an airtight container. Keep in mind that the size of your container will determine how often you have to mix up a batch. This is so easy, it's embarrassing to even give it a subheading! But here it goes! All you do is mix equal parts of each ingredient! That's it! I sometimes (very rarely) grate 1/2 a bar of Fels-Naptha and add it in there but like I said, totally not necessary at all! You can also add your Downy Unstoppables to your container or you can just add it with each load. When you're done adding all ingredients (which should take, oh let's see, 1 minute- if you opt out of grating) just give your container a good shake to mix up all ingredients. I usually shake for around 1 minute or so. So for $20 and less than 5 minutes of your time, you will have the best homemade laundry detergent ever! And you only need about 1 to 1.5 tbs per load! Yes, please! And when you run out you just mix your batch again! Or you could just mix all containers all at once and store in a bucket with a lid and refill your smaller container as needed. But it really isn't a hassle to mix every so often at all! Can you tell I'm really excited about this laundry detergent? I apologize it took me 8 months to tell you about it, but I really wanted to give it a while to see how it would work out. The verdict is it cleans great! It has removed marker stains, grass stains and different food stains like a champ without the aid of stain removers. That is so awesome in my book! I hope you give it a try and let me know how you like it! You can also check out my $5 Laundry Room Makeover and my Tips on Keeping A Clean & Tidy Laundry Room. Well, this sounds like a winner! And only three ingredients too! Love the super easy instructions. I've seen some on Pinterest that are very involved, so yours sounds like a piece of cake! Thanks for sharing! I've never tried the Downy unstoppables. Are they good? Do you just throw them in along with your detergent? I absolutely have to try this! I've thought about it before, but I've always wondered if it's effective. You just might have me convinced! 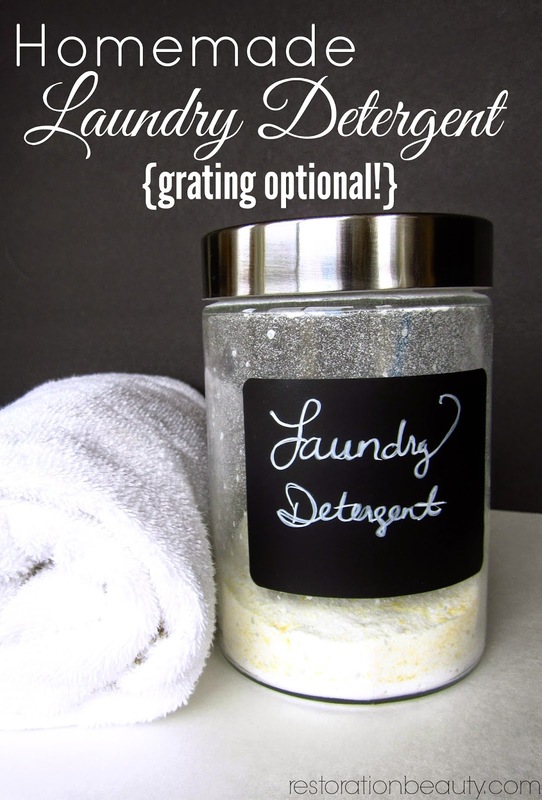 Have you ever added your essential oils to your laundry detergent? Really good here is more information for us thanks for sharing with us. Thanks for the great tips! Definitely helpful in my attempts to organize my home more effectively. I have a question regarding the detergent recipe. Can it be used with HE washing machines? Thank you for sharing valuable information I really appreciate your time and effort. A mom told me that she accompanied her child on a day trip to the kindergarten. Once they arrived, all the children were playing on the phone. Mom, thinking they were bored of death, proposed to teach them a game: Country, country, we want soldiers! Unfortunately, her offer was not successful. Far from being bored, the kids are trapped in a competition, who first concludes all the levels of a game. Mommy was very disappointed with the children's preference, but it corresponds to their image of playing kizi games. And, moreover, they were very together. Another mom told me that she had organized her teenage daughter's day. Once the invitations arrived, a complete silence lay down and everyone was sitting on the phone. Desperate, Mommy asked what had happened. Her daughter answered very serenely: we talk, but on Facebook. Mommy was sidelined. This virtual space is an intimate space as a deposit of experiences, ideas, images, etc. It is a new form of sharing that can be regarded as a socially alienated one, but it is not. Many children are less interested in toys themselves and more and more interested in tablets and video games. And that's because the toys are performing and leaving little room for the child to come up with something from it, to participate, to create. They almost do everything by themselves. And that puts the child out of the learning process. At most, they can be temporary pleasures. Parents always enjoy the very varied learning possibilities that these toys offer, but it is stressed that they do everything in the place of the child, his ability to use his imagination is very low. In addition, many of them form a child's partner, making play very solitary and not allowing interaction with the other. For example, a little boy told me that he spent hours in a row building very sophisticated legal, but he still does not allow a play partner because he would "spoil" his work. The main feature of the pogo games is that it allows the child to come closer to reality with his means. The first benefit is not cognitive in the sense of classical learning, but one in the sense of emotional development and maturation of the child in its social adaptation. The game allows them to understand, repeat, create, spoil, fix, feel many of the experiences they see around them and live them. It is absolutely necessary for a child to have the ability to play and to play the part of his inner universe. I propose to the children, when they are with me in the office, to play together. In this way, I can see if there is this habit of doing things together, building common games. I often find that children are generally absorbed by technological devices, which irritates their parents, if they are not, in their turn, absorbed in them, or find something to play by some alone. There are very few who still experience a Monopoly or Do not mind, brother! These games are of great value in developing the child's interactions, anticipating situations, experiencing frustrations, learning some rules, etc.